The Stena Jutlandica passenger-vehicle ferry has completed its first month of operation as a hybrid-electric vessel, with the operator reporting that the first weeks of service between Gothenburg, Sweden, and Frederikshavn, Denmark, have exceeded the company’s expectations. 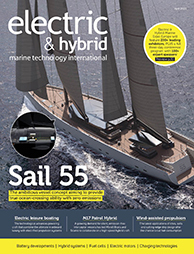 The environmental savings made from using battery power for reduced generator usage and maneuvering in port amounts to approximately 500 tons of fuel saved and 1,500 tons of reduced CO2. This corresponds to the annual emissions from approximately 600 cars. The project, which is being partly funded by the Swedish Transport Administration and the EU, is being carried out in several steps to enable testing and assessment while the vessel is underway. Step one has seen the vessel switch to electrical operation to reduce the use of diesel generators, as well as for maneuvering and powering the bow thrusters when the ship is in port. The technical solutions implemented here have been developed by Stena Teknik in collaboration with Callenberg Technology Group. 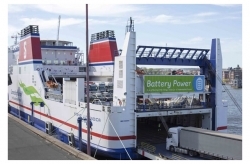 For step two, battery power will be connected to two of the four primary machines, which means that the Stena Jutlandica will be able to run on electrical power for about 10 nautical miles inside the archipelago out to Vinga Lighthouse in Gothenburg, Sweden. Work on step two has begun and the goal is for implementation within approximately three years. During step three, all four primary machines will be connected to the batteries and the ship will be able to cover the 50 nautical miles between Sweden and Denmark solely on electrical power. If the project is successful, battery power will be considered for other vessels within the Stena Line fleet.